This is an opportunity to show your support for an innovative business partnership between a coffee co-operative in Malawi and a Scotland-based Fair Trade business – this project will bring an added value Guaranteed Fair Trade coffee to Scottish consumers: a great tasting product for coffee lovers here with added benefit for the coffee farmers in Malawi. How did this partnership project come about? In February 2018, Bernard Kaunda and Christopher Gondwe, representatives of the Mzuzu Coffee Planters Co-operative Union in Malawi, came to Scotland to promote their roast and ground Fairtrade coffee and the benefits of Fairtrade certification. The Mzuzu Co-op has produced Fairtrade certified coffee since 2009. Although Bernard and Christopher spoke about the benefits of Fairtrade certification for their coffee, they also highlighted some of the challenges that they still face. Almost all coffee, wherever it is grown, is purchased as the ‘green bean’, usually by middlemen and then exporters: finally, it is then roasted and packaged in the destination country. The result is that the coffee farmers only receive a small amount of the overall profit. If the coffee beans are Fairtrade certified, the farmers receive a guaranteed minimum price, plus a premium to the community. Bernard and Christopher spoke of how they would like to add an added value coffee, roasted, ground and packaged in Malawi to their export range to bring added benefits for the farmers and their community. This is where we came in. We are a small Fair Trade enterprise based in Scotland called Fair Trade Scotland. We are a World Fair Trade Organization (WFTO) Guarantee System Member (the only one in Scotland). We have set up a partnership project with the Mzuzu Co-op to bring the added value coffee, roasted, ground and packaged in Malawi to consumers in Scotland and the rest of the UK. We strictly adhere to the WFTO 10 Principles of Fair Trade and are externally audited against them, crucially allowing us to measure the social impact of our trade on sustainable economic development. This coffee is the first in the world to have both the Fairtrade Mark and the WFTO Guaranteed Fair Trade Label – an absolute gold standard product! This innovative approach requires working capital and we are looking for 500 social innovators (FIRST 500) to support the project with £25. P&P included (UK ONLY). We have already purchased and imported five hundred 250g packs of Mzuzu Golden Coffee and have had printed temporary UK-friendly labels as their current labelling does not meet EU regulations – future packs will be printed with the correct label: each contributor will receive one of these packs so that you can try the coffee. We have also produced 500 (limited edition) signed A4 prints by well-known photographer Frank Johnston, of a Malawi coffee farm, which will be given with the coffee. Finally, as a FIRST 500 member, you will be given a discount of 10% off the normal retail price, on future purchases. Apart from the above benefits, we hope that people will enjoy being involved with this truly ground-breaking initiative. Once the final price per pack is determined, we will keep everyone informed of the costs involved throughout the value chain, resulting in a final RRP per 250g pack. We believe, as responsible consumers, that FIRST 500 investors will want to ‘spread the word’, thereby expanding the customer base. We hope that you can help us meet our target and support this innovative partnership between a farmers’ co-operative in Malawi and a Fair Trade social business in Scotland. Fair Trade Scotland is proud to launch the ‘FIRST 500’ – a venture with Mzuzu Coffee Planters Cooperative Union to bring to the UK, their single origin, roast and ground coffee, packaged in Malawi. 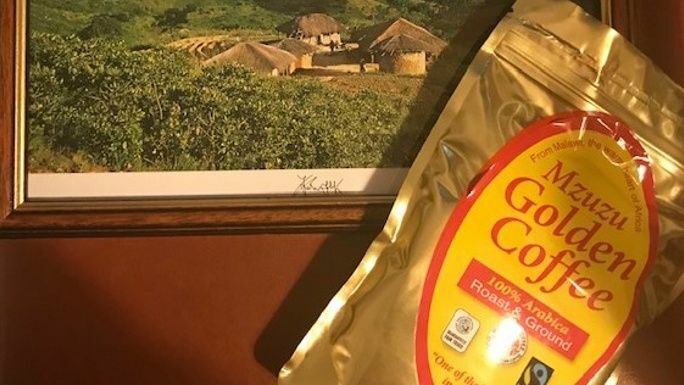 This investment pack will include a 250g pack of Mzuzu Golden Coffee, a discount of 10% off the normal retail price on future purchases, and an A4 print of a Malawi coffee farm by well-known photographer Frank Johnston.